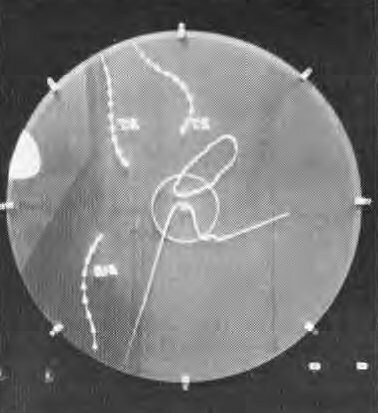 Until the 1970s, the raw radar image was written not too clear on small radar displays with a diameter of about 30 centimetres. The image could only be viewed by one person and in a dark environment. It were, after all, the vague glowing phosphor echoes on the screen from which the operator had to recognise targets and their position, and verbally had to pass on that information. As the military commanders began to see the radar as an important sensor, a growing need arose to map (plot) detected targets centrally in the command room. 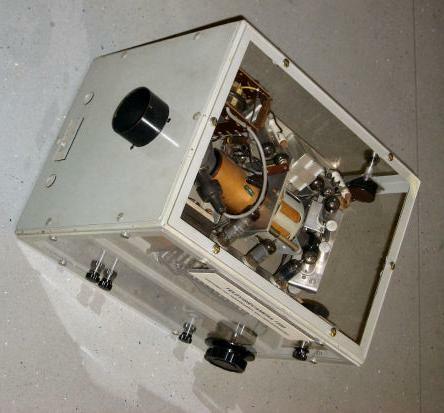 Initially, this was done by the radar observer who transmitted the coordinates of the echoes by telephone to the plotters at the plot table in the command room. Camera to convert radar images into TV image format via scan conversion (1958). The camera was used as ordinary TV-camera as well and could be mounted on a dolly. 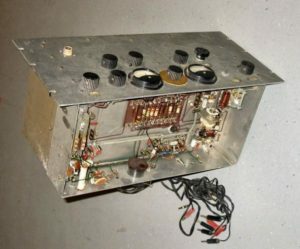 In the 1950s, the TNO research group of Piket MSc, later Moerman, already worked on the improvement of radar displays and the processing of radar data. In 1958, a TV camera was designed to convert radar images into TV images via scan conversion: the radar image stemming from a long-range radar was written on a cathode-ray tube with a long afterglow (slow phosphor) through a slowly rotating radar sweep (360 degrees in 10 seconds). The TV camera equipped with a Vidicon camera tube recorded the radar image. That was presented on a normal TV-monitor with the European 625 line system. The aim was to research whether it was possible to convert the unsharp radar images, which could only be viewed by one or two people in the dark, into TV images with a greater clarity that could be displayed in a normal room environment to a larger group of people, possibly on a large screen TV. The early Vidicon’s had an annoying feature for normal TV camera work. A fast-moving object was visible on the screen with an afterglow tail. Precisely this annoying feature was used by the scan conversion system. The radar video image, which was received by the sensitive layer of the Vidicon at the moment that the image was written on the radar monitor with the rotating radar sweep could be kept visible for seconds. The storage time was dependent on the scanning beam current of the Vidicon which acts as a discharge current of the “mosaic” (the sensitive layer) and thereby generates the TV video signal. Whereas for normal camera work a large discharge current was used to create the lowest possible tail effect, a small discharge current was used in the setup of this scanning conversion system. A negative effect that occurred when a small discharge current was set to the Vidicon was the leakage of the charge to mosaic elements in the immediate vicinity of the blip image. This resulted in a kind of smear effect that had a very adverse effect on the resolution. Setting the scanning beam current was a compromise between storage time and resolution. The scanning system was the first development in the early days of automating battle information systems: replacing the large plottable by a large-screen TV. 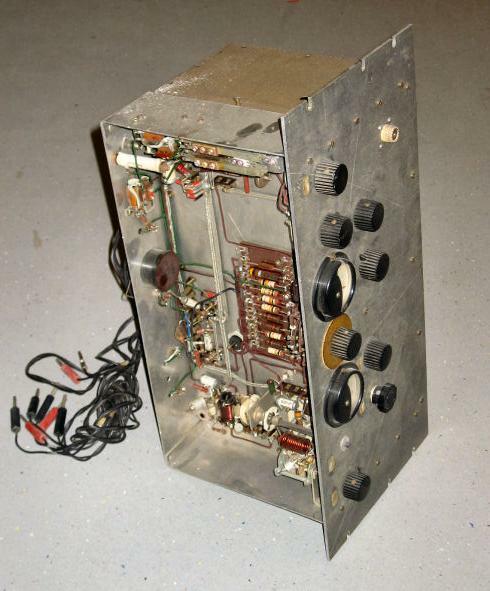 2-metre transmitter for transmitting radar images to a command room remotely from the radar (1958). An additional (lost) unit modulated the radar sweep information, a synchronisation pulse and the radar-video signal. 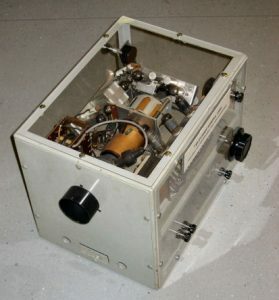 The transmitter has been used later for amateur radio communication (call sign PP1PL) and propagation experiments via the troposphere. 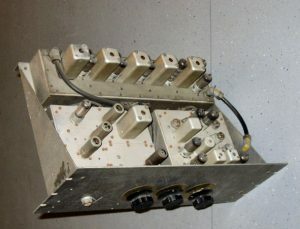 2-metre receiver. 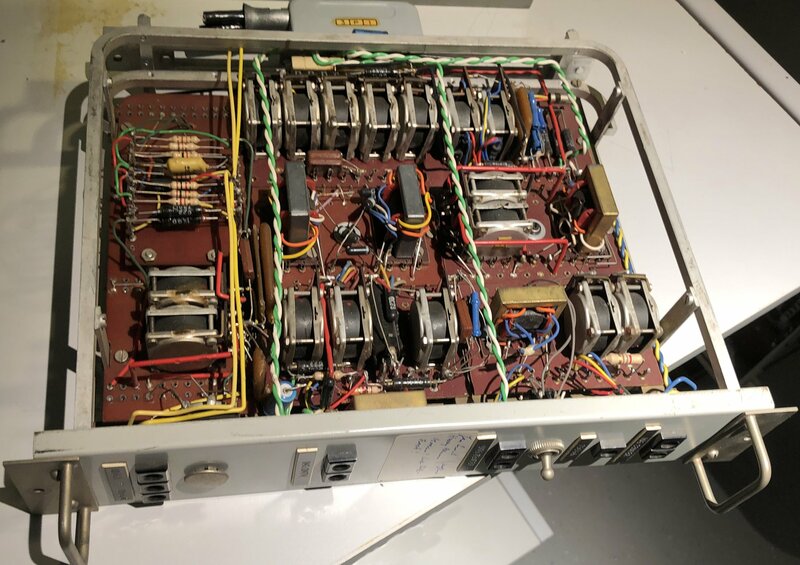 A separate (lost) demodulator unit re-established the synchronisation pulse, radar sweep signal and the video signal for a normal radar display with rotating deflecting coil. Reference grids (via the Videomap system). All signals must be written within the period of the radar sweep cycle. For automated processing of radar data, however, there was a need for displays with fixed deflection coils. Such displays enable the use of the “rest time” between two radar transmit pulses (the time that remains after the radar sawtooth has written the information of that radar sweep (the video information received by the radar receiver after sending out the radar pulse) – the so-called interscan period) to deflect the cathode ray so that random positions on the image can be reached. In this way, the display was able to show computer-generated (synthetic) information with positions of targets, certain symbols, speed and course vectors and additional information. Synthetic information requires the highest possible repetition frequency for writing a flicker-free image shown in the afterglow of the phosphor of the radar display. This requires that the sharp drop period of the saw-tooth is as short as possible. However, part of the interscan period must be used to reset the cathode ray at the end of the radar range (= end of a radar sweep) as quickly as possible to the origin position, which is generally the centre of the radar screen. After all, the next radar sweep has to start there. This also applies, of course, if the cathode ray has taken a position at the edge of the screen for writing a symbol. Even then the cathode ray must be back in time to the origin position in order to start writing the next radar sweep or a second synthetic position. If such a reset period is not short enough, the position of e.g. a symbol somewhere on the screen is influenced by the residual deflection of the previous radar sweep or a previously written synthetic position. As a result, a distorted symbol is written. The situation in which a short reset time is most important is when the cathode ray has to traverse the full diameter of the screen in order to take a new position at the other side of the display. The laboratory has therefore developed a number of displays with fixed deflection coils, especially for the Teletrack system (discussed below). 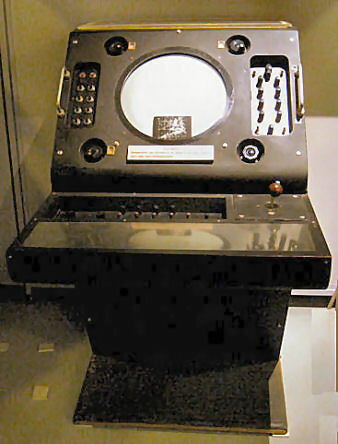 Teleplot (1950 – 1958) was in fact the replacement for the traditional plot system (see enclosed photos) where radar display operators transmitted the positions of the radar echoes (the targets) by telephone to the plotters at a large plot table. Each radar operator and his plotter operated a specific area of the air space. 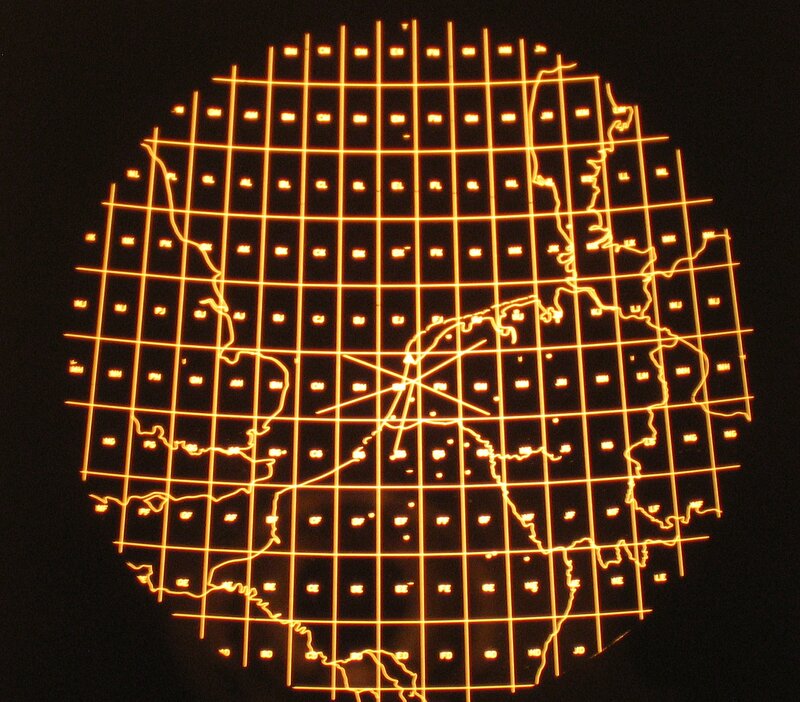 Through the image transformation of the Teleplot system, the transformed radar image could be reproduced on larger screens up to large colour image projectors. This allowed more operators to view the overall air picture simultaneously in a room with (moderate) ambient lighting. A test set-up was made of such a large-screen projection system. 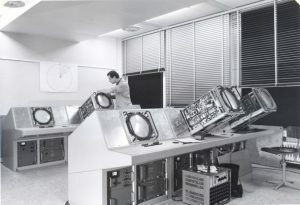 A very large test setup of the Teleplot system with many screens existed in the laboratory. Many demonstrations were given. 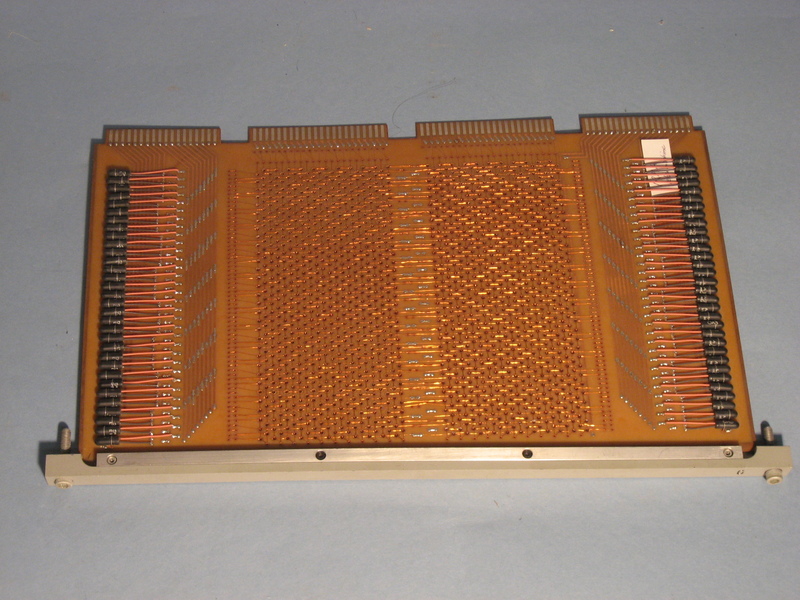 The radar contacts were displayed on a radar screen with a slow decaying phosphor. 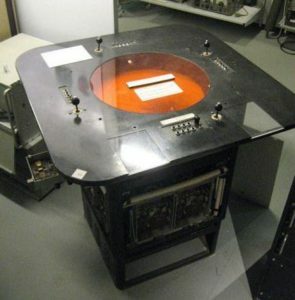 The radar image was reflected through a semi-transparent mirror onto the top of the perspex writing table; for the operator as if the radar image originated from the top of that perspex table. The operator could mark the echo tracks on that perspex plate using a white wax pencil. Using Schmidt optics (see photo) with a small, 6 cm diameter, Philips projection cathode ray tube with deflection coils and a focusing coil, a TV-like scanning grid with blue light was projected onto the 6 cm thick perspex plate. The scanning grid was focused onto the top of the perspex (the writing side). Where the blue light of the scanning grid hit markings made with the white wax pencil, reflections arose. These reflections ran inside the perspex layer at all angles and in all directions. Those reflections reflected again and again against the top, bottom and sides of the perspex but could not exit. Eventually a part of the reflections ended up at a 6 cm wide and flat ‘spout’. The light reflections could eventually exit and were caught by a photomultiplier. The exiting blue light was converted by the photomultiplier into a video signal. This video signal, supplied to another TV screen, generated a bright situation image. 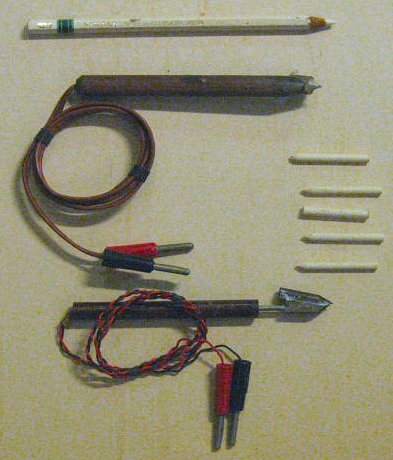 In order to get this complex setup working, all sorts of problems had to be solved up at that time such as the production of writing pens with white wax rods to replace the wax pencils. 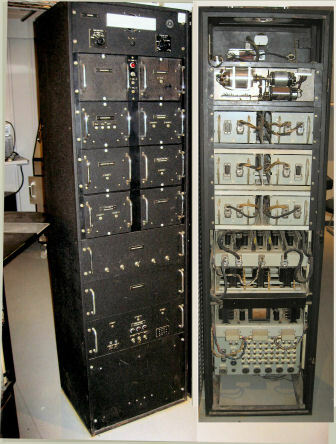 In 1958, Teleplot led to a complete system that was built and sold for years by Philips Telecommunication Industry (PTI) in Huizen and was used for years at the Royal Netherlands Air Force’s radar station in Nieuw Milligen. 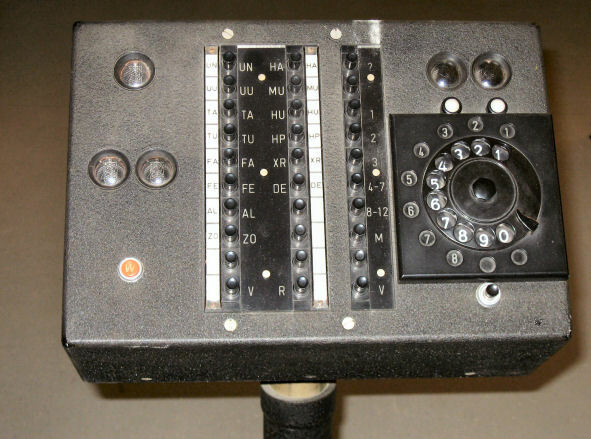 The Teleplot system, however, was still a manually operated system. Operators still had to identify targets and track them. In the end of the 50’s/early 60’s, the need arose to automate information processing of radar data. A display was developed that included an illuminated reference grid consisting of vertical and horizontal lines. Each grid square had a unique two-letter code and had an agreed finer subdivision. The radar operator reported, via telephone, the position of a target in a specific square by communicating the letter code and the finer coordinates. 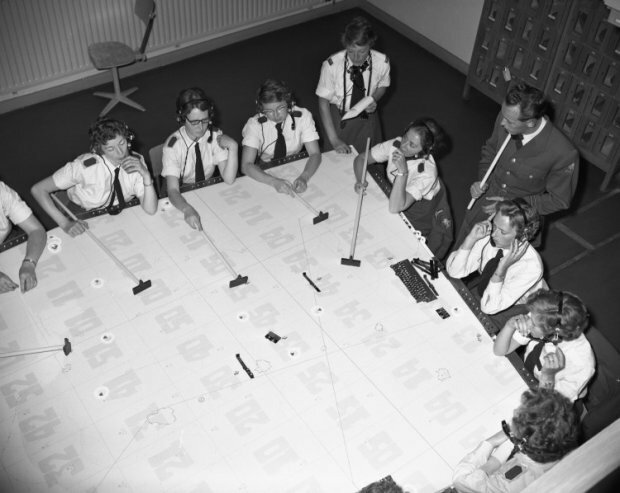 These echo positions were then reported to operators working in a well-lit room on a large plot table with the same reference grid. With long rakes, objects representing targets were moved to the reported position. Every operator at the plot table covered an own area of the table. The plot table with the reported targets gave a good situational overview to the air command. 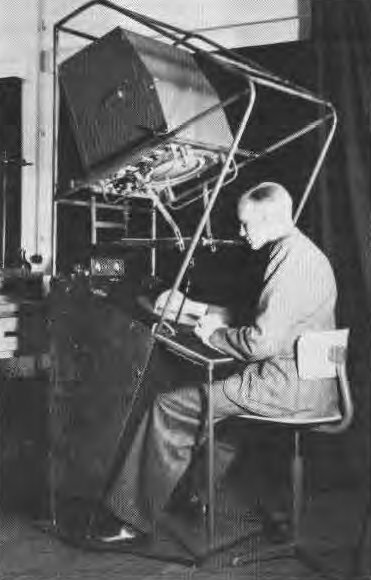 The Teleplot system was, however, sensitive to errors in reading and communicating positions from the radar screen by the radar operator and the misunderstanding of communicated coordinates by the operator at the plot table. 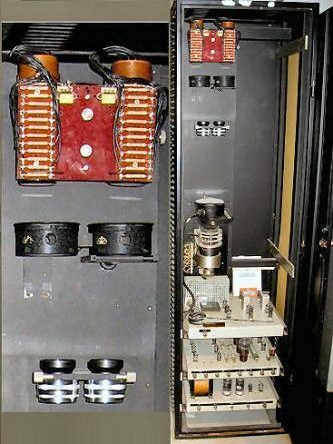 The Teletrack system (1963) consisted of a total of three displays with fixed deflection coils. 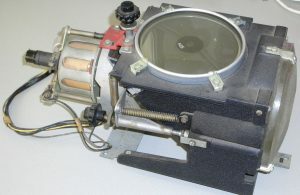 A 30-centimetre diameter display (L30) was used for the initiation of targets in the Teletrack system. Two 50 cm flat lying displays (H50 and H51) provided workspace for eight operators in total: three trackers and a supervisor at each screen. These operators had the task of verifying the predicted positions of targets in their sector with the reported radar echoes, and, if necessary, to correct the information using a joystick and a push button. 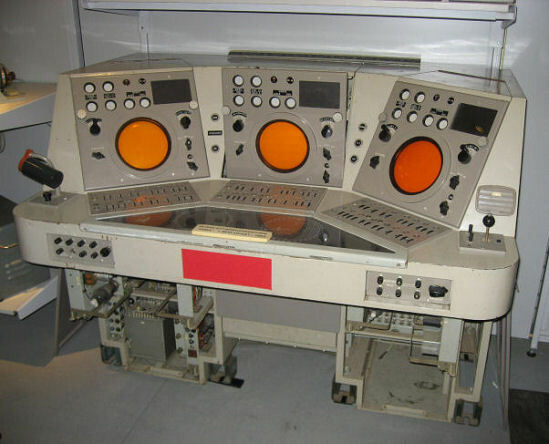 Additional units of the Teletrack system allowed the ninth operator (‘initator’) at the L30 display to request the measurement of the flying height of a target. For this purpose, the position of a selected target was automatically supplied by the Teletrack computer to a unit, the x,y/R,0 converter. This converter was not developed by TNO, but by PTI. The operator of the height radar then determined the target’s height. That value was sent back to the Teletrack’s digital memory and stored with the other data of the particular track. During quiet periods, the supervisor could act as initiator; his position had more buttons. The initiator assigned an identification number to a new radar contact; the radar contact then became visible on the screen as a single point. A track was initiated at a subsequent contact. Not all nine operators could communicate simultaneously with the interface and the processor unit. A selection unit examined with a certain repetition frequency all joystick panels on actions of the push buttons and joystick movements. Such actions resulted in signals that put certain processes into action in the other units of the system. For example, joystick moves in the x and y directions were added to the predicted track position. With the NC (no correction) button, two zero values ​​were added to the predicted value if the position was correct, otherwise the joystick movement was used for the new position and recalculation of the track. By pressing the button on the joystick, the marker position on the screen could be moved across the whole screen. That option was used to initiate a new contact and track anywhere on the screen. 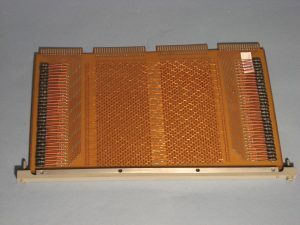 A 4K Philips core memory with 16-bit words was used as memory. That memory was purchased at the end of the year for a thousand guilders from the money left over on the departmental budget. Only later was an application was found to use the memory. Per track was recorded: the x and y positions (each 13 bits) in two words, the speed in the x and y direction (8 bits each) in one word, time (10 bits) in one word, the height (9 bits) in one word, strength (3 bits) and identity (3 bits) in one word, 14 bits for technical processing (new track, busy, pending, etc) in one word, and one word reserve. A total of eight words per track; therefore 64 tracks occupied 512 words. Teletrack systeem voor semiautomatisch volgen, verwerken en overseinen van radardoelen. De door een operator manuaal m.b.v. een joystick ingevoerde positie van radardoelen worden als tracks (bij afwijking gecorrigeerd m.b.v. joysticks door andere operators) automatisch bijgehouden door de computer. De tracks worden met speciale symbolen als een computerbeeld tezamen met het ruwe radarbeeld, weergegeven. Aanvullende informatie (o.a. identiteit wordt via de eenheid voor bijkomende informatie (EBI) ingevoerd of opgevraagd. Het bestand aan tracks (max. 60) wordt via datatransmissie overgestuurd naar de commando centrale te Millingen. De tracks worden aldaar als “early warning data” op het scherm van het Teleplot systeem weergegeven. The Teletrack system also included a height measurement display that was linked to a height measurement radar. That display system was not developed by TNO but was made available by the Royal Netherlands Air Force. The vertical sweeps of the altitude measurement radar allowed the operator to determine the height of the target on the altitude radar display. The height found was then manually stored in the Teletrack computer’s memory as part of the input data set of that target and could be queried at any time. Teletrack was later expanded with a unit that made it possible to transfer position and additional information of 64 targets that were stored in Teletrack’s memory at Navigation station North(-Holland), codenamed NSN, in Den Helder via a data link system to the Air Operations Control Station New Milligen‘s Teleplot system (AOCS NM). These tracks were displayed there as “early warning data” on the Teleplot system’s display. Note that the term navigation station was used for the deception of the actual operational objective of the station. 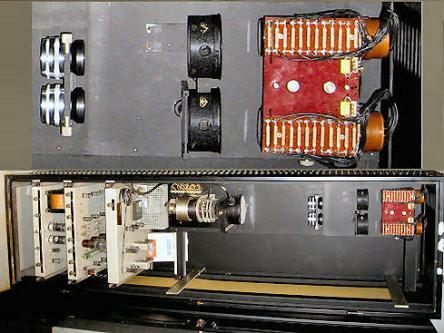 The Teletrack system contained an image generator unit developed by TNO with the name Videomap. The unit provided the ‘reference grid’ consisting of vertical and horizontal lines as a video signal. As indicated above, each grid square had a unique two-letter code. Simultaneously with this reference grid, a map was generated with, for example, the coastline of the Netherlands. On a 10-cm cathode-ray tube with flat screen and fast phosphor, a line rotated synchronously to the radar sweep. This line was projected onto a slide with a negative image of the reference grid: a black slide with translucent lines. In other words, the blue light beam of the cathode ray scanned the slide. Via a condenser lens, the light that came through the slide was amplified by a light amplifier. The output thus provided the video signal of the reference grid. This output was synchronously written with the radar signal on the operator screen. The intensity of the displayed reference grid could be changed manually by the operator. 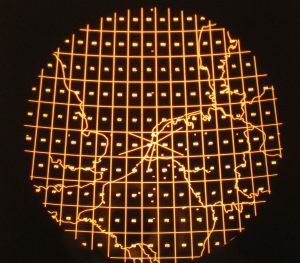 This Videomap-system replaced the illuminated ‘overlay’ on the radar screen. Teletrack has served for many years the Royal Air Force in Den Helder. Personnel of the Air Force was trained by TNO for both operational operations on the displays and for the maintenance of the complete system. 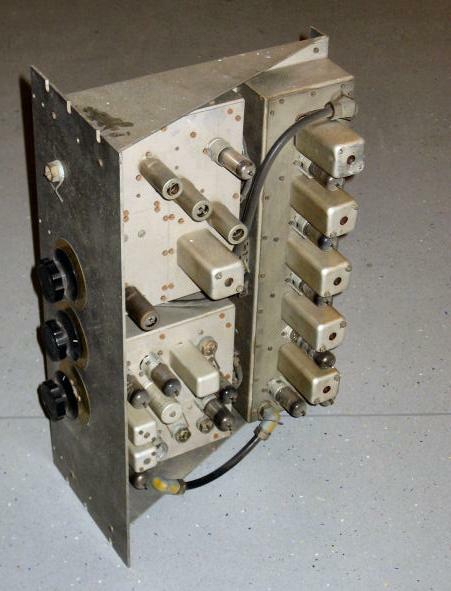 Teletrack thus became the trigger for further automation projects by TNO for the Royal Netherlands Air Force. 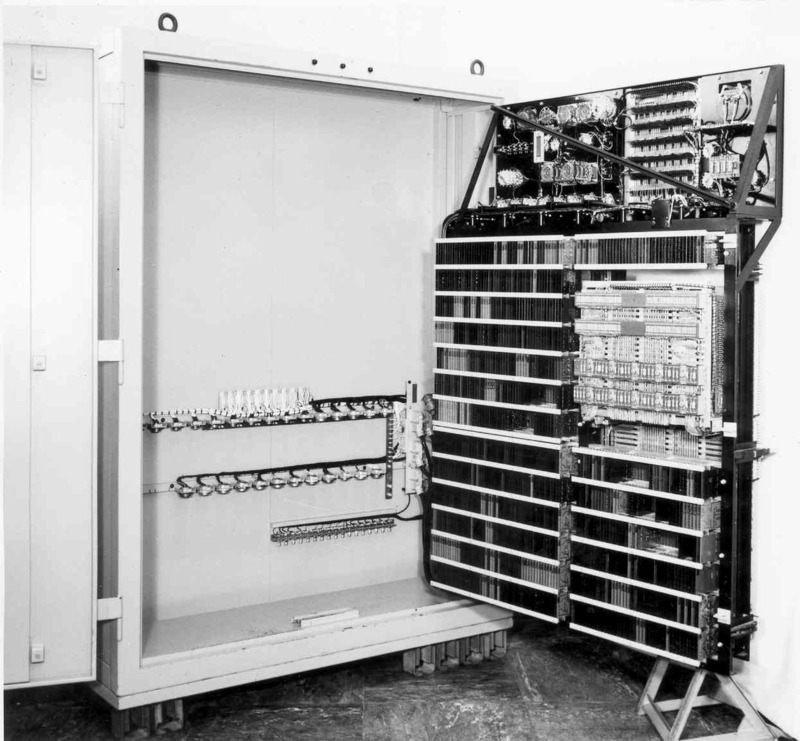 In 1964, Teletrack was connected to the Interception Calculator (IRMA) that was also developed by the laboratory. The digital computer part and the operating panels for interceptions on the IRMA screen were designed by the (now former) research group Digital Calculations. The specific triple screen, of course with fixed deflection coils, was developed in 1963 by the TNO research group Automation Combat Information Systems (AGIS). The development was based on digital computation technology that had been developed since 1995 in projects that has been commissioned by the Royal Netherlands Navy. Twelve simultaneous interceptions could be carried out and supervised via this screen. An interception is the interception (possibly an attack) of a fighter aircraft on an enemy air target. The requirement at that time was accurate tactical guidance for the fighter plane from the ground for the route to fly, at what height, how fast, and with which turns to bring the fighter near the enemy target for a successful interception. Many data points that were previously difficult to determine with specific hand computing devices by the interception officer and passed on to the pilot of the fighter plane. The IRMA system calculated the data points with which the interception could proceed more automatically. The system would bring the pilot to a distance of about 2.5 nautical miles from the target, after which the pilot should use visual detection of the target for initiating his attack. The IRMA system with an analogue radar echo-tracking system (EVA = ‘echovolgapparaat’) developed by the LEOK was initially tested at the Navigation and combat information school (NAVGIS) of the Royal Netherlands Navy in Den Helder. IRMA was planned for operational deployment on the Dutch aircraft carrier Hr. Ms. Karel Doorman. EVA could follow six echoes automatically. However, this analogue tracking system, intended for the purposes with which and for which intercepts were to be performed, turned out to be unable to provide the positions accurately enough and track them for the time needed for an interception. In tests, however, IRMA did not show the expected simplification of the human task of the Marine interception officer. The Air Force put the idea forward to link the IRMA system to the Teletrack system. For that reason, the IRMA system was moved to the radar station of the Royal Air Force at Den Helder. After modifications to both systems, Teletrack was used as an input system for IRMA. Parallel to this technical development, NATO decided that the HNLMS. Karel Doorman would no longer perform an air defence function. The Royal Navy then decided to phase out the Karel Doorman and no longer make new investments. The Air Force, however, liked the IRMA. The IRMA-Teletrack combination was operationally deployed at air bases for many years. Many interceptions were successfully carried out by air force officers, and air force personnel. Marine personnel also became acquainted with semi-automatic radar data processing systems through the use of these two systems. As a result, the Defense organisation learned what requirements they had to impose on further automation of various combat information systems. 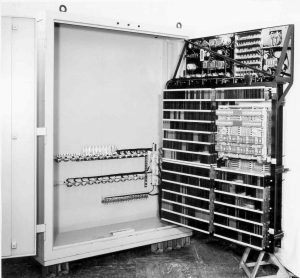 After this development period, the research group Automation Warfare Information Systems (AGIS) needed its own display cabinet system with fixed deflection coils. These were needed to further the automation of the radar information systems. The output of various projects could be made visible and demonstrated on this image screen cabinet system. The system consisted of seven screens, six of them with electronic tubes and one display based on transistor technology. Five of the six radar screens for experimentations can be seen on the photo below. One display was placed near the central control systems in a separate room (later the FUCAS room). The transistor display is located at the right near the window. Presenting and demonstrating images of the System for Automatic Display or data Link Information (SADLI): the transfer of target-related information from large ships to smaller vessels of the fleet. In the end, this system was never realised. Up to 1990 as a presentation and control system for the FUCAS project (Follow-up Computer Assisted Inertialess Scanning System).